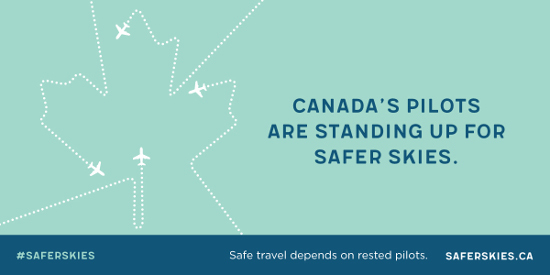 TORONTO--More than 8,000 passenger and cargo pilots have joined forces to launch SaferSkies.ca, a campaign to inform Canadians about the country's outdated aviation fatigue regulations and to urge the government to enact stronger protections to aviation safety. Fatigue is the most pressing aviation safety concern for Canada's pilots. Today's current rules are more than 20 years out of date, do not align with accepted fatigue science, and lag far behind other jurisdictions. Extensive research on this issue has established the link between aviation safety and fatigue management. As NASA's Ames Research Center notes, common practices for pilots – shift work, night work, irregular or unpredictable work schedules, and time zone changes – are factors that result in performance-impairing fatigue. Twenty years after Canada's current regulations were last updated, draft regulations to manage fatigue by establishing limits to pilot duty periods were published by Transport Canada on March 25, 2017. The draft includes some improvements – but they do not go far enough to protect pilots, passengers and the aviation sector. "We believe updated fatigue rules must be based on science," said Milt Isaacs, CEO, Air Canada Pilots Association. "Today, Canada permits pilots to fly long-haul flights at night for 12.5 hours or longer. The recent draft to the regulations would reduce that to 10.5 hours. But that's a full two hours longer than the limit established by NASA research, which recommended a maximum duty period at night of 10 hours – or 8.5 hours of flight time. Canadian pilots and their passengers deserve better." Canada's current fatigue rules are out of sync with scientific research and lag international standards. This persists despite a consultation process for industry stakeholders that began in 2010 and involved pilot groups, operators, and Transport Canada. Meanwhile, the United States and Europe have implemented science-based fatigue rules. "For seven years now, we have been mired in a multi-year regulatory review process," said Captain Dan Adamus, President of the Air Line Pilots Association, International (ALPA) Canada. "Through this process, we have seen extensive lobbying by airline operators who have essentially – and troublingly – argued that operational considerations are more important than human physiology, science and a concern for safety." The Safer Skies campaign is calling on Transport Minister Marc Garneau to address the shortcomings in the draft regulations to ensure Canada's regulations reflect fatigue science and align with other jurisdictions. "Every time pilots fly, they are focussed on passenger and public safety," said Jerry Dias, National President, Unifor. "Not only are these regulations not in-line with science, but some operators may not have to implement updated rules until 2022. We're asking passengers and the public to help pilots in their mission for safety. Please sign our petition to encourage the government to fix these flawed regulations and make it right." The U.S. Federal Aviation Administration updated its fatigue rules after a flight crashed in Buffalo, New York in 2009, killing 50 people. Fatigue was found to be a critical factor in this tragic accident. Today, U.S. fatigue rules limit pilots to 8 hours of flight time at night, making them even more stringent than science recommends. "Americans learned the hard way, but we don't have to," added François Laporte, President, Teamsters Canada. "Let's not wait until after an accident to update the rules on fatigue. The government needs to make this right – lives are at stake." The Safer Skies campaign is supported by Canada's four largest pilot groups: the Air Canada Pilots Association; Air Line Pilots Association, International; Unifor, and Teamsters Canada. They believe in one level of safety for all – for all Canadian pilots, crew and passengers to keep Canada's skies safe and our aviation standards world-class. For more information on fatigue and the urgent need for change in Canada's aviation safety regulations, visit SaferSkies.ca. The Air Canada Pilots Association (ACPA) represents the largest group of professional airline pilots in Canada, with some 3,400 members fly passengers and cargo around the world on Air Canada and Air Canada rouge. The Air Line Pilots Association, International (ALPA) represents and advocates for more than 55,000 pilots at 32 U.S. and Canadian airlines, including Air Georgian, Air Transat, Bearskin, Calm Air, Canadian North, First Air, Jazz Aviation, Kelowna Flightcraft, and Wasaya. Unifor is Canada's largest private sector union, with more than 310,000 members across the country, working in every major sector of the Canadian economy. Unifor represents pilots at airlines that include Sunwing, Cargojet, Morningstar, Pascan, Propair, Westwind and EVAS. Teamsters represent 125,000 workers in Canada in all industries, including pilots at Air Inuit and Air Creebec. The International Brotherhood of Teamsters, with which Teamsters Canada is affiliated, has 1.4 million members in North America.